Celebrating this year the 50th anniversary of its presence in Europe, Shimadzu emphasizes its Excellence in Science approach through the release of the new Nexera Mikros, a micro flowrate-compatible liquid chromatograph mass spectrometer. The Nexera Mikros highlights the company’s position of a world leader in analytical instrumentation. It maintains the durability and operability of LC-MS systems while providing a significant increase in sensitivity. In pharmaceutical development analysis occasionally has to be performed on trace amounts only of components in small blood samples. Examples include studies of the pharmacokinetics of new drug substances or their metabolism. In such cases, LC-MS systems compatible with nano flowrates have been utilized, in order to improve the efficiency of the intake of target components to the mass spectrometer. However, nano flowrate-compatible LC-MS systems often suffer from complications in terms of instrument operability and processing speed, such as a tendency for pipes to clog, difficulty in discovering liquid leaks, and the hours required for analysis of a single sample. Nexera Mikros achieves at least ten times the sensitivity for target compounds compared to standard LC-MS analysis. This is due to the LC-Mikros, a solvent delivery pump with a new control system to reduce pulsation and deliver a stable solvent flow even at low micro flowrates. In addition, positioning of the ionization interface has been optimized for more efficient sample introduction into the mass spectrometer. Microscopic gaps (dead volume) in the piping connectors lead to a decrease in sensitivity by causing peak dispersion. 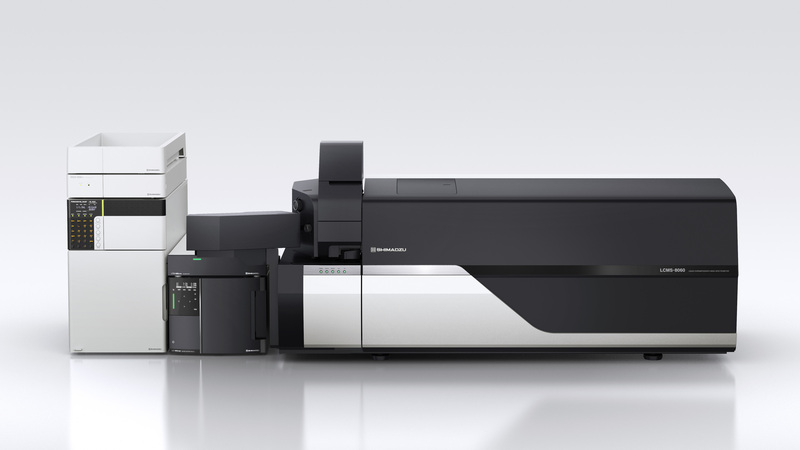 UF-Link, a connection mechanism between Shimadzu’s newly developed analytical column and the mass spectrometer, ensures high sensitivity and, at the same time, enables one-touch connection between the analytical column and the ionization interface for the mass spectrometer. In addition, UF-Link is compatible with connections between commonly used analytical columns and the ionization interface, so column selection is flexible to suit the target sample. The LC-Mikros solvent delivery pump serves a wide flowrate range, from micro flowrates of 1 µL/min to semi-micro flowrates of 500 µL/min. By enabling analysis comparable to existing LC-MS systems and high-sensitivity analysis at micro flowrates, this single unit improves operational efficiency of the LC-MS system and shortens research and development times. Shimadzu has released the Nexera Mikros, a micro flowrate-compatible liquid chromatograph mass spectrometer. The Nexera Mikros maintains the durability and operability of LC-MS systems while providing at least ten times more sensitivity. It can accommodate a wide range of flowrates, from semi-micro flowrates (100 to 500 µL/min) to micro flowrates (1 to 10 µL/min).With this product, Shimadzu is contributing to improving productivity at pharmaceutical companies and clinical contract research organizations.